Watch the A Positive Narrative for the Global Community session from the World Economic Forum's Annual Meeting 2017 here. Bratty, entitled, lazy: just some of the adjectives you might come across in reference to millennials. Of course, the idea that we can define such a broad group of people – the term is used to describe anyone, from any culture, born between 1982 and 2004 – in such a sweeping manner is in itself ludicrous. More importantly, though, these negative stereotypes just don’t match the research that’s been carried out into this much-misunderstood generation. So what does that research say? If you believe the headlines, there’s never been a more work-shy generation than millennials. But according to a 2016 US workplace study, that couldn’t be further from the truth. It found that millennials were far more likely than others to be addicted to work: “More than four in 10 (43%) of work martyrs are millennials, compared to just 29% of overall respondents.” The study also revealed that American millennials were much less likely than their older peers to use all their vacation allowance. You can’t beat that fuzzy feeling you get when you’ve made a positive difference in the world. Maybe that’s why 74% of millennial job-seekers told LinkedIn they wanted to know that their work matters. But as nice as fuzzy feelings are, they don’t pay the bills – certainly not when you take into account colossal student debt, rising rents and stagnating wages. 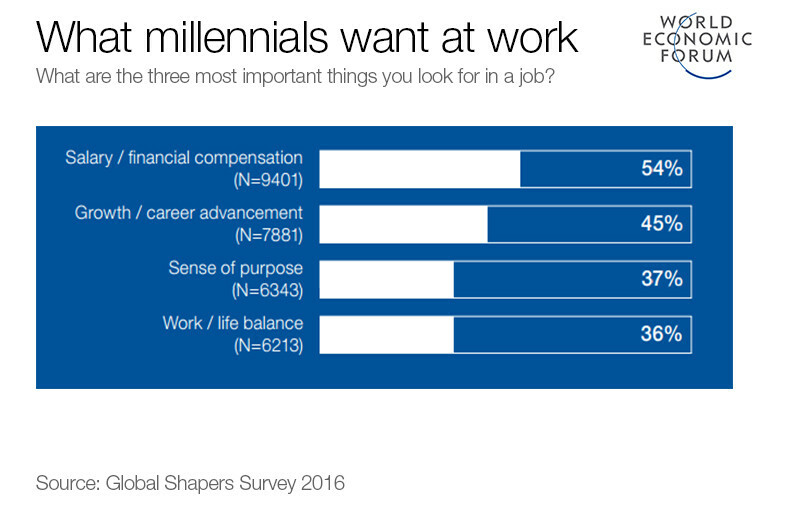 As much as millennials want to find purpose in work, according to a Forum survey they still say compensation and career progression are the most important factors in a job. Another myth busted by the Forum survey was the idea that millennials are self-absorbed egoists. Far from living in their own bubble, most survey respondents identified as “global citizens” who were highly engaged in developments taking place in the world around them. 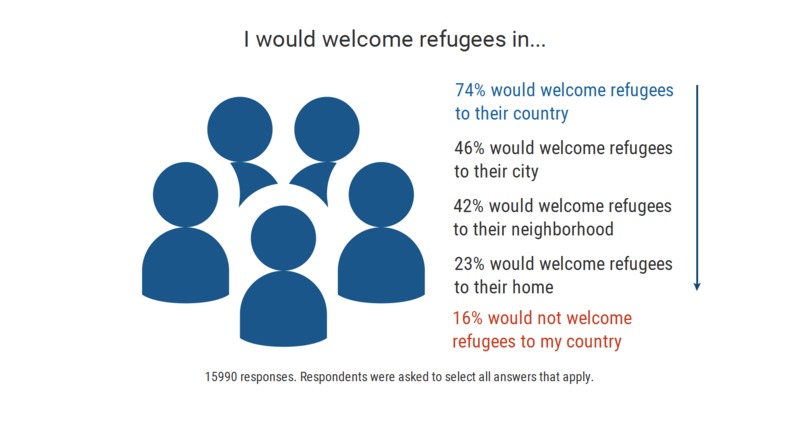 Take the refugee crisis as an example: 74% said they’d welcome refugees into their countries, and over 20% said they’d even make space for them in their homes. They’d be well within their rights to have a moan once in a while: after all, they’re the first generation to be worse off than their parents. But as it turns out, millennials aren’t anywhere near as negative and pessimistic as some commentators make out. 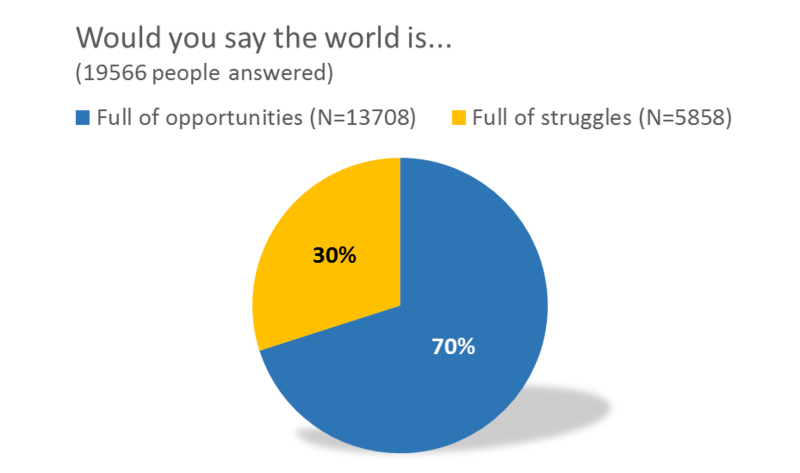 Of the 26,000 millennials who answered the Forum’s survey, 70% of them said the world is full of opportunities.